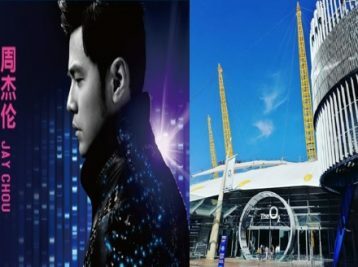 Not to be missed… The King of Asian Pop Jay Chou will be bringing his The Invincible 2 World Tour to The O2 Arena on the Friday 26th and Saturday 27th April. The multi-talented Taiwanese first came to prominence in 1998 after winning a local talent contest where he showcased his piano and song-writing skills. Although Jay Chou is a classically trained musician, his music fuses together both Chinese and Western style R&B, rock and pop genres. Chou describes his concerts as being “all about nostalgia and old school tracks”, with songs being about domestic issues, war and growing up in a modern urban environment. In November 2000, Chou’s first album, Jay, was released to critical acclaim being nominated for five Golden Melody Awards and becoming one of the Top 10 Best Selling Mandarin Albums of the Year. Chou has built on the success of his first album, releasing a new album practically every year. Each one gaining him further awards for his musical talents including Golden Horse, Golden Melody and World Music Awards. He has sold over 30 million albums Worldwide and his music has been downloaded more times than Madonna, Rihanna and Eminem. Although Chou is well known throughout Asia, most notably in regions such as his home country Taiwan, China, Hong Kong, Japan, Malaysia, Singapore, Thailand, and in overseas Asian communities such as Australia. He has not performed regularly in Europe. His last appearance in London was back in March 2017 at the Wembley Arena in North London. Tickets for his performance “Sold Out” in under 30 minutes! So the two concerts at The O2 Arena are a must see for his adoring fans in the UK. The O2 Arena is a multipurpose venue situated on the Green peninsular, formally known as the millennium Dome in celebration of the new millennium. Although The O2 Arena can be reached by public transport, you might wish to arrive for your night in style. Here at TST Car Services we are able to offer a range of competitively priced London chauffeur cars to take you and your guests to and from The Invincible 2 World Tour at The O2 Arena in comfort and style.